ELKO, Nev./ISTANBUL (Reuters) - U.S. President Donald Trump joined European leaders on Saturday in pushing Saudi Arabia for more answers about Jamal Khashoggi after Riyadh changed its story and acknowledged that the journalist died over two weeks ago at its consulate in Istanbul. Saudi Arabia said early on Saturday that Khashoggi, a critic of the country's de facto ruler Crown Prince Mohammed bin Salman, had died in a fight inside the building. Germany called that explanation "inadequate" and questioned whether countries should sell arms to Saudi Arabia, while France and the European Union urged an in-depth investigation to find out what happened to the Washington Post columnist after he entered the consulate on Oct. 2 for documents for his marriage. The Khashoggi case has caused an international outrage and frayed political and business ties between Western powers and U.S. ally Saudi Arabia, the world's No.1 oil exporter. Asked during a trip to Nevada if he was satisfied that Saudi officials had been fired over Khashoggi's death, Trump said: "No, I am not satisfied until we find the answer. But it was a big first step, it was a good first step. But I want to get to the answer." Trump's comments about the Khashoggi incident in recent days have ranged from threatening Saudi Arabia with "very severe" consequences and warning of economic sanctions, to more conciliatory remarks in which he has played up the country's role as a U.S. ally against Iran and Islamist militants, as well as a major purchaser of U.S. arms. 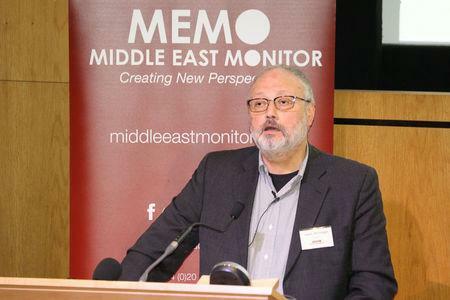 Riyadh provided no evidence on Saturday to support its account and made no mention of what had become of Khashoggi's body. French Foreign Minister Jean-Yves Le Drian called for a full investigation and German Chancellor Angela Merkel, in a joint statement with her foreign minister, said the Saudi account was not enough. "We expect transparency from Saudi Arabia about the circumstances of his death ... The information available about events in the Istanbul consulate is inadequate," the Germans said. Trump said it was possible that Prince Mohammed had been unaware of the circumstances around the death of Khashoggi, 59. Trump said he would speak with the prince. For Western allies, a main question in the Khashoggi affair will be whether they believe that the prince, who has painted himself as a reformer, has any culpability. King Salman, 82, had handed the day-to-day running of Saudi Arabia to him. Trump, who has forged close ties with Saudi Arabia and the crown prince, said he was concerned that it was unclear where the journalist's body is. Turkish investigators are likely to find out what happened to the body "before long", a senior Turkish official said earlier on Saturday. Turkish sources say the authorities have an audio recording purportedly documenting Khashoggi's murder inside the consulate. Pro-government Turkish newspaper Yeni Safak, citing the audio, said his torturers cut off his fingers during an interrogation and later beheaded him. A group of 15 Saudi nationals arrived in Istanbul in two planes and entered the consulate on the same day Khashoggi was there and later left the country, a Turkish security source told Reuters. Saudi Arabia had until now strenuously denied that Khashoggi had died in the consulate. A Saudi official told Reuters separately: "A group of Saudis had a physical altercation and Jamal died as a result of the chokehold. They were trying to keep him quiet." Khashoggi's Turkish fiancée, Hatice Cengiz, tweeted in Arabic: "They have taken your body from this world, but your beautiful smile will stay in my world forever." Saudi Arabia's regional allies - including Egypt, Bahrain and the United Arab Emirates - issued statements in praise of the king. Asiri joined the Saudi military in 2002, according to Saudi media reports, serving as spokesman for a coalition backing Yemen's ousted president after Prince Mohammed took Saudi Arabia into that country's civil war in 2015. He was named deputy chief of foreign intelligence in 2017.